How to be a Mermaid was exactly what I hoped and expected from the blurb. It follows Tara who is a professional mermaid, she dons a mermaid tail and does shows in aquariums. Then things change and she really does become a mermaid. I really liked getting a view of professional mermaiding, I didn’t even knew this really existed before reading this book. Tara is living her dream life, until her dream really becomes real. Her reaction to finding out mermaids are real was so realistic, disbelief and then almost scared. Her world gets upside down and it takes her a while to get used to this. I loved that aspect, she didn’t accept things too easily, but she did deal with her new reality pretty well. Then there is the whole mermaid aspect which I loved. I am not sure why, but there’s something I love about mermaids. How they are both human and fish and live underwater. The underwater setting and focus on mermaids really worked for me and I thought the descriptions of being underwater and the story was well done. The pace of the story was done well, even though it’s short it didn’t feel rushed. Things wrap up nicely at the end and I felt like it was the perfect length for the story it tells. I liked the ending and how the main issues are solved and the ending gives a view of how Tara her life is in the future with an epilogue. There’s also some focus on our ocean and the creatures that live here and how human are damaging the ocean, but it was more of a sub plot and not in preaching way. I liked the explanation for why Tara turned into a mermaid, it made sense and there was an original twist involved. It was fun to see Tara figure things out and then having to decide what to do next and how to deal with this change. Tara was a great main character. She’s pretty realistic, nice and helpful. When she realizes someone is in danger she wants to helps. She’s the best person for the job and she realizes that and convinces the others of that as well. I also liked the little fish she meets in the ocean, Sponge I think his name was. The other sea creatures we meet were interesting as well, but I liked him best. And the sea witch was an interesting character as well. Uranus, the boss of the aquarium the mermaids are originally from is also an interesting characters, especially when we learn his story towards the end. We don’t learn a lot about the other professional mermaids and Tara almost forgot about them when the focus switched to the real mermaid and ocean aspect. I did feel sorry for Christine as she was worrying about Tara, the first time I could understand why Tara didn’t say anything as she didn’t plan anything, but the second time I thought she could’ve said sometimes to put the others at ease. So some of the side characters stayed a bit flat. There is some romance in this book as well, but it didn’t really work for me. I didn’t really feel their connection. Sure Finn was a nice guy, but I didn’t really feel it. I liked how he protected the ocean and did his best to help the creatures who lived there, I just didn’t feel the spark between him and Tara. Even so I didn’t mind the romance and I did think it was well done, I just hoped for a little bit more. And the fact that mermaids didn’t know what kissing was, was a bit weird. I mean they still know things about the surface right? And how do they show love and affection to each other then? It just didn’t make sense to me. The world building is there, but there isn’t too much depth to it. I did like getting a view of the world underwater and how things worked there with the mermaids and other sea creatures and I could pretty well imagine how it looked like. On the other hand a lot of things do stay unclear like how the humans never find them, how their society works, the sea witch her potions etc. And for example the kissing incident made me wonder how much the mermaids knew of the world above ground. To conclude: this was a fun and enjoyable mermaid story. I really enjoyed this book. The mermaid aspect and the explanation of why tara changes into one was well done. There’s an original twist surrounding Tara and I liked seeing the pieces fall on it’s place and her finding out what to do next and how to handle the change. I didn’t really feel the romance and there are some questions left unanswered about the underwater world and society, but I didn’t mind too much as the interesting story made up for it. 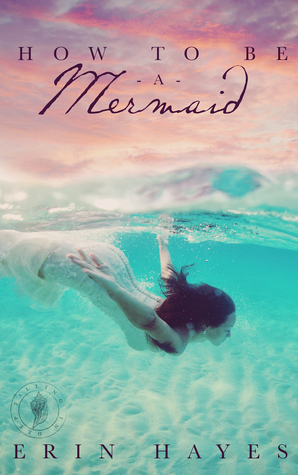 I would recommend this if you are looking for an enjoyable short story about mermaids with an original twist. Tell me about books with mermaids that you read? Any recommendations for good mermaids books? I haven’t read many mermaid books either, except for one adult one as far as I can remember and that one was a bit weird. This definitely was a great read and I am looking forward to read more by this author. Keionda@Keionda Hearts Books recently posted…Discussion #12: ^^ *SMOOCHES* Yo. Kiss Meh You FOOL. I haven’t read a lot of mermaids books for the same reason and the ones I did read where disapointing, but this one was great! Definitely worth a read if you’re looking for a fun mermaid book! I haven’t read a mermaid story in a while and this one sounds pretty good the way you describe it. I liked Derrolyn Anderson’s Marina’s Tales series (not perfect ratings, but likeable) and Amanda Karen Hooper’s The Sea Monster Memoirs was good, too. Yes this one was a pretty good mermaid story and I really liked how the mermaid aspect was handled. I’ve never heard of that series and book you mentioned, will have to check it out. Sounds good although for the life of me I can’t get into mermaids and water fantasy novels. I didn’t care for Poseidon, those scary sirens, or even pirates. I don’t read a lot of mermaids or water fantasy novels, even though I do like mermaids, it just seeems so hard to find a good book with them. I haven’t ever read a mermaid book and all I can think about is the movie Splash which I loved! I like that she didn’t accept things readily as that seems to be a valid response to finding out a myth is real! Pity about the romance but it still sounds fun! I liked that part the most, she was actually scared and surprised that mermaids were real. her reactions was so realistic. Even though the romance wasn’t great this was still a great book. Yay! I hope you’ll enjoy it! This book pleasantly surprised me and Tara her reaction to finding out mermaids existed was so well done. It was a lot of fun! Well…that is different! Professional mermaid? I’d never heard of that either! lol Sounds very interesting. Thanks for the heads up, Lola! anna (herding cats & burning soup) recently posted…Book Deals–New Releases (8/18) & Sales & Freebies! Yeah it was a fun short story with her being a professional mermaid and then finding out mermaids were real. I kinda want to see a professional mermaid act now, it soudned pretty cool in the book.